Sudden onset or acute shoulder injuries are ones which happen suddenly, often through a fall onto an outstretched arm or through direct impact, overstretching or overloading. It is important acute shoulder injuries are treated as soon as possible with the PRICE principles of immediate first aid. Always seek medical advice if the pain is severe or you are in any doubt. A rotator cuff strain is a tear to any of the four ‘rotator cuff’ muscles in the shoulder and is common in throwing and racket sports. Symptoms include sudden shoulder pain and a feeling that something has torn. Pain may also radiate down into the arm. Rotator cuff strains can range from mild to very severe. Immediate first aid applying the PRICE principles is important followed by a gradual rehabilitation and strengthening program. Read more on Rotator cuff strain. A dislocated shoulder is very traumatic and painful injury and occurs when the head of the humerus (upper arm bone) pops out of the shoulder joint. It usually dislocates out forwards as the arm is forced upwards and outwards, damaging soft tissue, tendons, and ligaments in the process. Severe pain will be felt with rapid swelling around the shoulder joint which is likely to appear deformed or ‘dropped’. It is essential emergency medical attention is sought if a shoulder dislocation is expected. Do not try to pop it back into place as this can cause permanent injury to nerves or blood vessels. Read more on Dislocated shoulder. A posterior shoulder dislocation is less common and occurs when the head of the humerus moves backward out of the socket. This is a relatively rare injury as most shoulder dislocations are anterior. It may be caused by contact sports, car accidents or a fall. 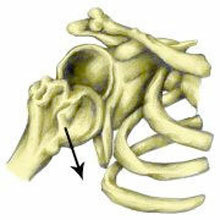 This shoulder injury results in a complete loss of function and severe pain, for which medical help is urgently needed. An AC joint separation, or AC joint sprain, is a tear to the ligament that joins the acromium and clavicular bones at the top of the shoulder. It is usually caused by a fall onto an outstretched arm and can range in severity from mild to a complete tear of the ligament. Severe pain and swelling will be felt at the time of injury and will radiate throughout the shoulder initially, but later on, the pain will be more localized to the bony part on the top of the shoulder. Immediate first aid is important and strapping or taping the shoulder is usually recommended to prevent long-term deformity of the shoulder. 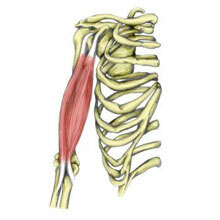 This is a tear or strain of the long tendon of the biceps muscle which originates from the shoulder. It is more common in older athletes. Sudden sharp pain is felt at the front of the upper arm/shoulder. Swelling may be visible over the front of the shoulder joint. Contracting the biceps muscle against resistance is likely to be painful and in particular, lifting a straight arm up forwards against resistance is likely to reproduce pain at the front of the shoulder. Read more on Long head of biceps rupture. A clavicle fracture is also known as a broken collarbone. The bone can be fractured by a fall. Symptoms include severe pain in the collarbone, sometimes with swelling over the area and a bony deformity is often seen. If a broken collarbone is suspected then seek medical attention immediately. An x-ray will confirm the fracture. Treatment will involve immobilizing the arm with either a figure of eight bandage, sling or collar and cuff. A figure of 8 bandage is designed to prevent the collarbone shortening as it heals and is usually preferred to the sling. Pain relief is the main aim in the early stages and a doctor will usually prescribe pain-relieving medication. After a period of complete immobilization (1-2 weeks), the arm should then be gently moved to prevent shoulder stiffness. A full rehabilitation program with mobility, stretching, strengthening and sports specific exercises should be done. Read more on broken collar bone. A shoulder sprain is damage to the shoulder ligaments or capsule which support the glenohumeral or shoulder joint. This is caused by a stretching of the fibers or partial to full tears of the ligaments or joint capsule, like if the arm is pulled backward. The shoulder will feel painful and tender, often with swelling, which can be eased by rest and putting the arm in a sling. Symptoms will vary depending on how bad the injury is and can range from mild to very severe and will include pain in the shoulder, usually at the front of the joint. There will be tenderness when pressing in on the area of injury. Rapid swelling may appear and the shoulder will be painful to move. 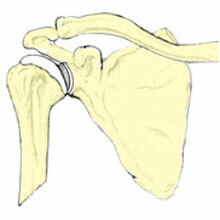 Severe shoulder sprains may result in instability of the shoulder joint. 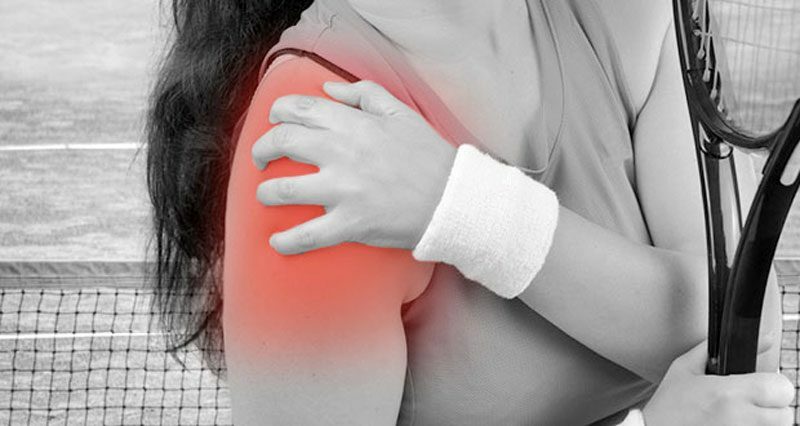 A sprained shoulder is caused by a force on the arm which stretches the shoulder ligaments. Usually, this involves the arm being forced backward when it is raised to 90 degrees at the shoulder. 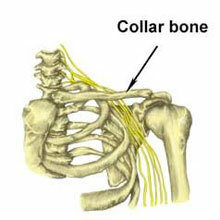 This causes stretching or tearing of the ligaments or capsule at the front of the shoulder. 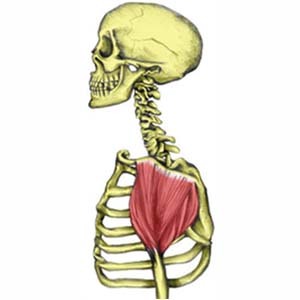 This is not a particularly common injury as the ligaments of the shoulder are very strong and the muscles & tendons at the front of the shoulder, such as the pectorals are more likely to be injured first. Treatment is to rest the arm. A sling may be useful to take the weight off the shoulder. Apply ice or cold therapy products to ease the pain, bleeding, swelling and inflammation. See a sports injury specialist who can assess the injury. A doctor may prescribe anti-inflammatory medication and refer for investigations such as MRI scans if necessary. A professional therapist may use electrotherapy treatments such as ultrasound or laser to reduce pain, swelling, and inflammation as well as advise on a rehabilitation program to regain full movement and strength, once the shoulder is pain-free. Contusions are caused by a direct impact to the muscles, usually from a hard, blunt object such as a hardball or an opponents elbow! 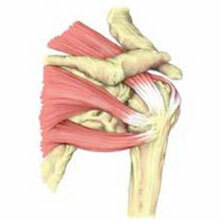 The deltoid muscle on the outside of the shoulder is most likely to suffer a contusion as it is superficial and exposed. Symptoms of pain in the muscle after impact with swelling and bruising developing soon after. With a severe contusion, the athlete will have difficulty lifting the arm out sideways. They may complain of having a ‘dead’ arm and the muscle will be tender to touch. Treatment involves resting the arm and applying the PRICE principles of protection, rest, ice and compression. Apply a sling if necessary to protect the muscle and allow it to heal. Apply ice or cold therapy products as soon as possible and regularly to ease the pain, bleeding, and inflammation. Read more on deltoid strains & contusions. A fractured neck of the humerus is often caused by falling onto an outstretched hand or a direct impact to the shoulder. It is seen more often in young adults, adolescents and the elderly. A sling will need to be worn to allow the fracture to heal, before commencing rehabilitation exercises. 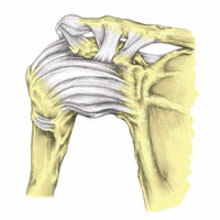 Read more on the treatment of this shoulder injury. The Humerus is the bone at the top of the arm which fits into the glenoid or socket of the shoulder to form the glenohumeral joint. 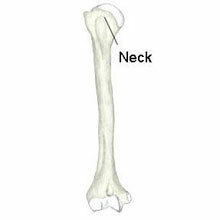 The neck of the humerus is at the top of the bone. A fracture is a break in the bone. Fractures with more than two fragments, those displaced more than 1 cm or associated with shoulder dislocation would most likely require an operation to assess the damage further. A fracture which is only displaced a little may be treated conservatively, i.e. without surgery. Impacted fractures heal quickly and are supported in a broad arm sling. Displaced fractures are best treated with a collar and cuff which will allow gravity to correct any misalignment/angulation. For the first two weeks, the arm should be kept in a sling underneath clothes for additional protection. After two weeks pendular exercises of the shoulder joint can begin. From four weeks a collar and cuff can be worn outside clothes and then gradually removed in stages over the next two weeks as the arm progresses. A growth plate fracture, or epiphysis plate fracture, occurs at the end of a bone in children before the bone has fully turned from cartilage to hard bone. A proximal humerus fracture occurs in the upper arm, near the shoulder, and is normally caused by a hard impact like a fall. There will be severe pain and swelling in the upper arm and movement will be difficult. A growth plate fracture is usually caused by a fall or impact on the arm or shoulder, although it can occur in parts of the body through overuse. Symptoms include sudden pain in the upper arm and shoulder at the time of injury with rapid swelling in the shoulder. Attempting to move the arm will be painful and it is possible the shoulder joint may appear deformed. Long bones such as the Humerus grow from the ends. At each end, there is a growth (or epiphyseal) plate which is the last part of the bone to harden from cartilage. For this reason, it is the most susceptible area to injury. Growth plate fractures occur in children and adolescents. This area is rarely injured in adults as the ligaments and other soft tissues surrounding the joint are stronger in a child than the soft bone is. This results in the bone being the first casualty! In adults, the soft tissue is more likely to be injured. If a fracture is suspected, immobilize the arm and seek medical attention as soon as possible. An X-ray or MRI will be taken to confirm the diagnosis and the amount of displacement of the bones. Non-displaced injuries may be treated conservatively with a period of immobilization to allow healing, followed by rehabilitation to regain full strength and movement. Fractures, where the two bones are separated or misaligned, may require surgery. Surgery aims to realign the bones and fix them in place using pins or wires. Immobilization is again required to allow healing and should also be followed by rehabilitation. 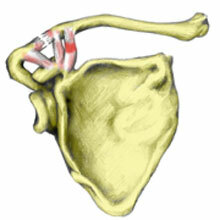 A scapula fracture is a break in the shoulder blade bone at the back of the shoulder. This is a relatively uncommon injury, making up only 1% of all fractures, and can be caused by direct blows and car accidents. Symptoms include a severe shoulder pain at the back of the joint and difficulty moving the arms. Read more about the causes, symptoms, and treatment of this fracture. Broken shoulder blade symptoms consist of sudden pain at the back of the shoulder at the time of impact along with rapid swelling. Pain will be felt when attempting to move the shoulder or upper back and the patient will struggle to raise their arms above head height. Tenderness will be felt specifically over the shoulder blade itself. Scapula fracture or broken shoulder blade is caused by either a direct impact to the scapula from a blunt object or from a fall onto the arm or shoulder. Car crashes are amongst the most common causes of the injury. If a fracture is suspected, seek medical attention. An X-ray can be used to confirm and determine the extent of injury or displacement. A doctor will also perform an examination, checking for signs of neural or vascular injury such as numbness, tingling, weakness or a reduced pulse in the arm. In most cases, a scapula fracture is treated conservatively – without surgery – as a displacement of the bones is rare due to the muscles holding the two (or more) parts close together. The arm may be immobilized in a sling to reduce the weight of the arm on the shoulder. Early range of motion exercises are encouraged to maintain should movement and prevent stiffness. Most scapular fractures heal in around 6 weeks. Once pain-free strengthening exercises can be used to regain full strength and maintain healthy movement patterns at the shoulder. In cases where the bone is fractured into multiple pieces or the bones are displaced considerably, then surgery may be required to fix the scapula back together using wires or pins.